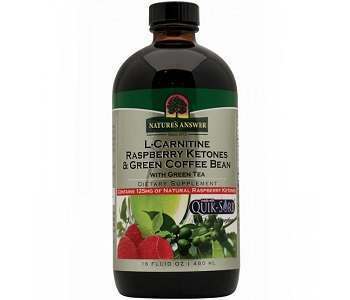 This a review of a product by Nature’s Answer called L-Carnitine, Raspberry Ketones & Green Coffee Bean with Green Tea. This is a liquid weight loss product that contains a blend of ingredients popular for their weight loss properties. This product also contains Quick-Sorb for fast absorption. The manufacturer does not really explain what this product is designed to achieve, they rather explain their manufacturing process and what they hope to deliver to you with their products. The manufacturer explains that they use a careful extraction technique so that you will get all the benefits of each herb contained in their products. This product contains a few ingredients that seem to be enhanced when combined for their weight loss effects. The product includes L-Carnitine, Raspberry Ketones, Green Coffee beans containing 50% chlorogenic acid, and Green Tea Leaf Extract. L-Carnitine is an amino acid that is believed to oxidize fatty acids for energy. It is also believed to have appetite suppressing qualities. Raspberry ketones are what give raspberries their aroma. They are believed to increase the rate at which we burn fat. The are also believed to reduce fat stores already in the body. The chlorogenic acid compound in green coffee beans is what helps you to lose weight. It also provides antioxidant effects. Green tea leaf extract is believed to boost metabolism. This product also contains vegetable glycerine, purified water, citric acid, natural flavor, stevia, Quick-Sorb (ginger, amla fruit, cayenne fruit). It is recommended to take one tablespoon a day, with a meal. You should keep the bottle refrigerated after you have opened it. There are no mentioned side effects. However, the manufacturer cautions that this product is only for adults and that pregnant and nursing women and those on other medications should consult a doctor before taking this product. This product comes in a 16oz. bottle. You can easily buy this product online directly from the manufacturer’s website. One bottle will cost $29.99. There are no other purchasing options for buying this product in bulk. This product could work out expensive in the long run if there are no ways to save money. The manufacturer also provides a list of other stores where you can buy this product. Shipping if free. The manufacturer offers a 100% satisfaction guarantee. f you are not happy with the results of the product, you are able to return the unused portion within 30 days for a refund. We are not sure this is really enough time to try out the product. We found very few user reviews for this product which leads us to believe it is not widely used. However, the few that we did find were positive. This seems to be an innovative formula combining a few different weight loss ingredients together to enhance each other. It is also in liquid form which may be easier to take for some people. However, the quantities of the ingredients are not as high as they would be when finding them in individual products which may affect the overall effectiveness of the product. There are not many reviews for this product so it may not be very popular. It is also unfortunate that there are no discounts for buying in bulk. The guarantee is also short to really try out the product.